While deputies were checking the perimeter of the building, they observed a white male inside the store. Deputies identified themselves to the male who fled to the back of the store. The suspect ran out of a door on the rear of the business. 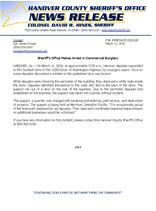 Due to the perimeter deputies had established on the business, the suspect was taken into custody without incident. If you have any information on this incident, please contact the Hanover County Sheriff’s Office at 804-365-6140.